Restorative dentistry services focus on repairing tooth damage and solving problems after decay or tooth loss. 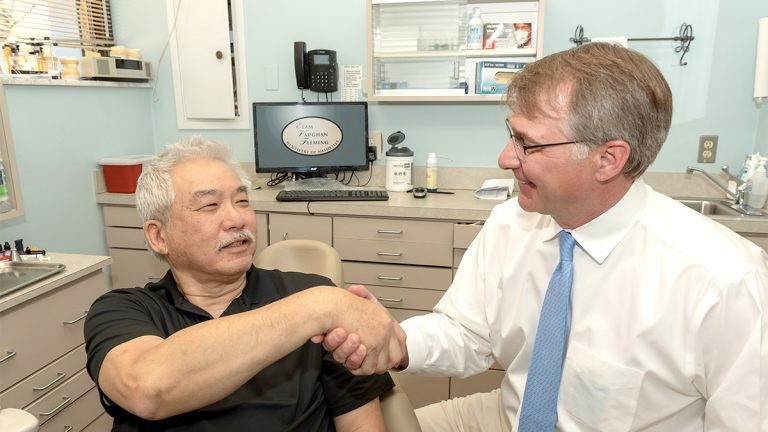 Dental problems can be devastating, but patients who have suffered a tooth loss or tooth damage don’t have to lose hope. At Dentistry of Nashville, we have the skill, knowledge, and technology to restore your smile. With our restorative dentistry services, you can feel confident in your smile again and enjoy the same tooth functionality you enjoyed before your tooth loss. Our dental crowns can be used to restore your tooth shape and protect your tooth after it has suffered significant damage. We craft our dental crowns with the highest quality porcelain to restore your tooth’s natural translucence and color. For patients who have missing teeth, a dental bridge is an affordable and effective option for restoring your smile. Dental bridges use a series of dental crowns to fill in the gap left by a missing tooth. With a dental bridge, you’ll be able to enjoy a full smile again. Our dentures are custom made for each patient to provide optimal occlusion and comfort. At our practice, we offer both implant supported dentures that will never slip or click out of place, as well as traditional dentures. Root canals can be used to save your tooth even after the pulp chamber has been infected. Root canal therapy will clean out the bacteria that is causing the infection and alleviate your toothache.